Elrehka was born to a respectable Iridonian couple in year 259ABY. Her biological father was a pilot, working transporting legal goods from planet to planet. When Elrehka was two years old however, her parents did not return from one of their journeys. Their ship had been bombarded with meteors en route to their destination, leaving Elrehka an orphan. 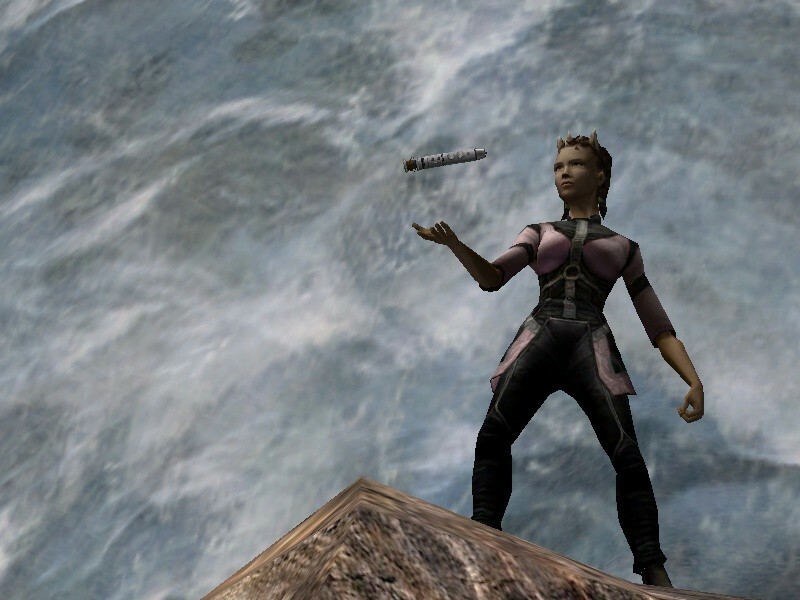 The Quena’s official home was set up on the planet Manaan, where Elrehka resided during the incident. After the death of her parents, Elrehka was simply handed over to the nearest orphanage on world. A further 4 years on, Elrehka was adopted by a wealthy couple who took in over a dozen orphans like herself. There she was quiet, but friendly, minding the contents of her own little world. Only a single year further, she met Jedi Knight Nivek Tholmai, who had been visiting a friend in the city. Her force sensitivity had been noticed by the Jedi Knight, however he made no move toward her, until later the very same day, he glimpsed her with the dozens of other children the Phazuli couple had taken in, sitting in the corner alone. The Jedi Knight approached her and asked where he could find her adoptive parents. Nivek spoke to them, and the Phazuli nodded in agreement, announcing Elrehka would be safe to leave with him for Yavin IV, to have her tested, to eventually become a Jedi Trainee. Elrehka was informed, and she packed her few belongings. The Jedi Knight however, lent her a set of Jedi tunics, for her to wear during her stay in the temple she was heading to, which she wore, and found fitting, in a way she didn’t yet realise. After saying goodbye to the Phazuli couple, the two of them set off; en route to Yavin IV. Elrehka didn’t think much of leaving her homeworld, she gazed in amazement as she saw the stars and outer space for the first time as she sat up front with the Jedi. During the journey, Nivek described the Jedi to her, and she sat, quietly, but smiling as she listened eagerly. He did not promise she would become a Jedi, he only promised she would be tested, the rest was up to her. A further few cycles on, Elrehka was taken up to the Council Room in the Temple she stayed at. Whilst there, she was questioned in a way that surprised her. Only to realise it was the final thing to do before becoming apart of the Jedi Order. In addition, she was given her own blue-bladed lightsaber, for her to train with as well as her own robes, datapad, commlink, and Training Remote. She thanked the Council with delight before being shown her new room. By the time she was alone, Elrehka was sure that this would be her new family, home, and life.